CP 130 ... gaining momentum. RIGHT: CW50-HL ... a CW 50 variant in which a sun-screening solution is integrated. Reynaers Aluminium will be showcasing systems that cater specifically for the Egyptian market at Project Egypt, the country’s leading exhibition for the construction and real estate sectors. The second edition of the major construction materials and equipment event is being held at the Cairo International Convention and Exhibition Centre in Cairo, Egypt, from February 8 to 11. “We have chosen Project Egypt as a platform to build relationships with key stakeholders and industry professionals in Egypt. Additionally, this is an opportunity for our existing customers to be informed about the latest trends in aluminium systems, showcased through Reynaers’ latest innovations,” says Ali Khalaf, managing director of Reynaers Middle East (RME), the regional office of the leading Belgian aluminium systems provider. 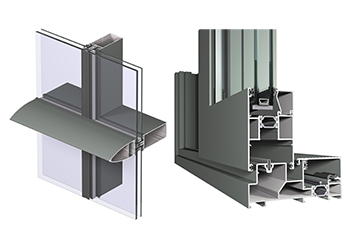 On display at the event will be Reynaers’ CW 50 curtain-wall series. In addition, the CW 50-HL (Horizontal Lining), CP 130 and CP 96 PA sliding systems will also be showcased. Although Reynaers’ entire product range is offered to the Egyptian market, its curtain-wall systems such as the CW 50 HL and CW 50 SC series have gained popularity in the region. Among the sliding systems, the CP 130 series has also gained momentum in the past few years. At Project Egypt 2017, Reynaers will be promoting the CP 130 Concept Patio, a highly insulated slide and lift-slide system that meets the highest requirements with regard to insulation, stability and safety. The system links up perfectly with the CS 77 series of window systems. The Lead headquarters ... a Reynaers project. Reynaers Middle East-Egypt, the Egyptian branch office of RME, was established in 2012 and has proved to be among the resilient business units in RME’s portfolio, according to Khalaf. “Despite the country’s current business environment, we have managed to secure viable projects and build ourselves as a reliable systems brand. While most of our counterparts contemplate holding investments back when the environment is volatile, we intend to employ strategic marketing initiatives that should help achieve our business goals,” he adds. Some of the earlier projects undertaken in Egypt by the company include the Cairo International Conference Hall 5, Le Meridien Pyramids Hotel extension and Suzan Mubarak Children’s Museum. 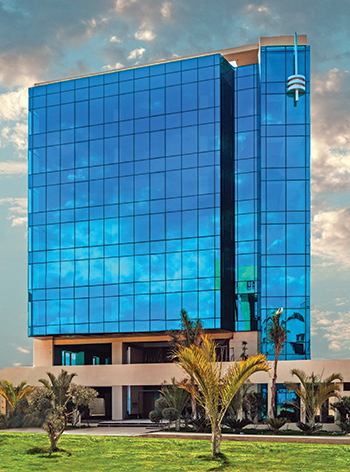 The more recent projects that employ Reynaers systems include the Etisalat headquarters, ABC Bank building, Cleopatra Mall, Sief office building, Mall of Egypt, Lead headquarters and Petro Gas office building, among others. Khalaf says the Egyptian market also offers potential in the residential sector. Several notable villa projects undertaken by Reynaers include the Amer House, Shadi Hani, Ahmed El Wassif, Mohammed Farouq and Mohammed Masnour villas. Reynaers Middle East is part of Reynaers Aluminium, which provides innovative and sustainable architectural aluminium solutions including a wide variety of window and door systems, curtain-walling, sliding systems, sun screening, conservatories, skylights, screens and systems to incorporate blinds and ventilation grids. Established in 1965 and with its headquarters in Duffel, Belgium, Reynaers Aluminium has offices in more than 30 countries worldwide. Reynaers can be visited at Stand E2 at Project Egypt.